AFC SUDBURY were formed in 1999 after the merger of 2 local teams Sudbury Wanderers and Sudbury Town. They started in the Eastern Counties League Premier Division, finishing 3rd in their first season. In the next 5 years they were champions on every single occasion, despite having the facilities in place. Finally in 2005-06, they took up promotion, despite only finishing 3rd. The Isthmian D1 North was their destination and they coped with the step up excellently, finishing in the playoff places in each of their first 2 seasons. Their bids for promotion did not end in success, and in 2008 they were transferred to the Southern League D1 Central for a couple of seasons, before going back to the Isthmian. Up until last season was a series of mid table finishes, but after finishing 3rd there was more playoff heartache as they lost out to Brentwood Town in the semi final. The club reached the FA Cup 1st Round in 2000. After beating Southend Manor, Brook House, Heybridge Swifts, Leek Town and Belper Town, they faced then football league side Darlington. That was where their dream ended, with them crashing out 6-1, but it was still a great showing to get that far. The FA Trophy 1st Round has been reached on 3 occasions, but the biggest case of 'always the bridesmaid, but never the bride' has to be in the FA Vase. In 2002 they reached the semi-final, losing to Tiptree United, just missing out on a Wembley final. They did, however, make the cut for the following 3 seasons but Brigg Town, Winchester City & Didcot Town were the victors on each occasion. Local cup success has been had in the Suffolk Senior Cup in 2003/04 and also the Eastern Counties League Cup in 2006. 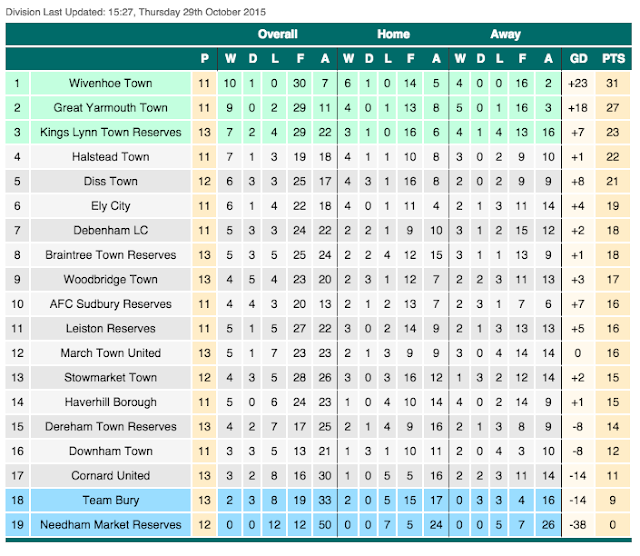 As for the reserve team, they joined the Eastern Counties League Division 1 in 2013. They finished 14th & 19th in their first 2 seasons but this season has seen much better progress with them sitting in 10th at the start of the game. Visitors Wivenhoe Town would be tough opposition, however, topping the league with 10 wins and a draw from their 11 games so far. As my parents were away until late on Friday evening, I decided that a bit of football was in order. 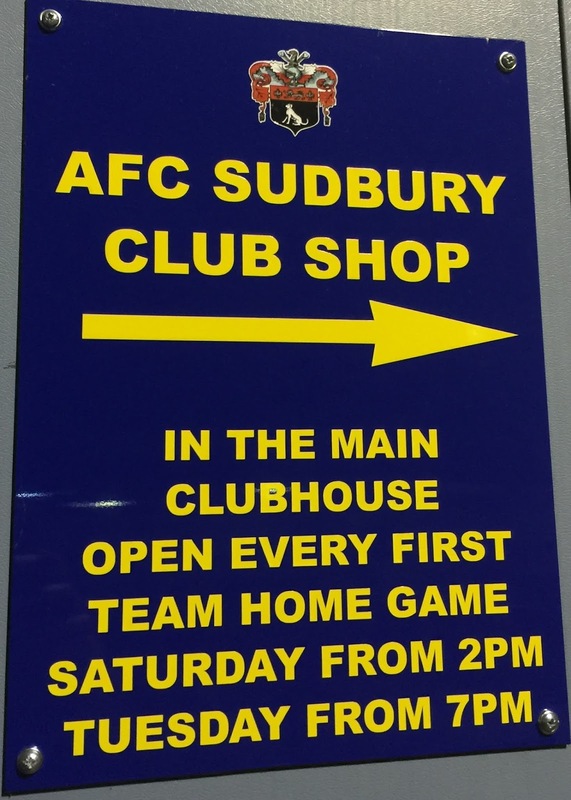 There were plenty of options, but the closest was AFC Sudbury v Wivenhoe Town. It was actually their reserve team that played in the Eastern Counties League but as it was a decent ground and a good standard going on previous experience, I was happy to go. I was even more pleased when Anwar said he would come, as well as Dan & Maurice who I'd planned to meet in Braintree which would help a great deal with fuel costs, as well as providing great company. On the day of the game, it was a very busy day at work, and I didn’t get finished until 1.15PM. I then went home, getting some lunch, having a bath and leaving to meet Anwar at 4PM. I got to Anwar at 4.20 and we were soon on our way. I'd planned to meet mates in Braintree at 6.15 and despite 20 minutes delay on the M25 we made it up elsewhere and arrived bang on time. 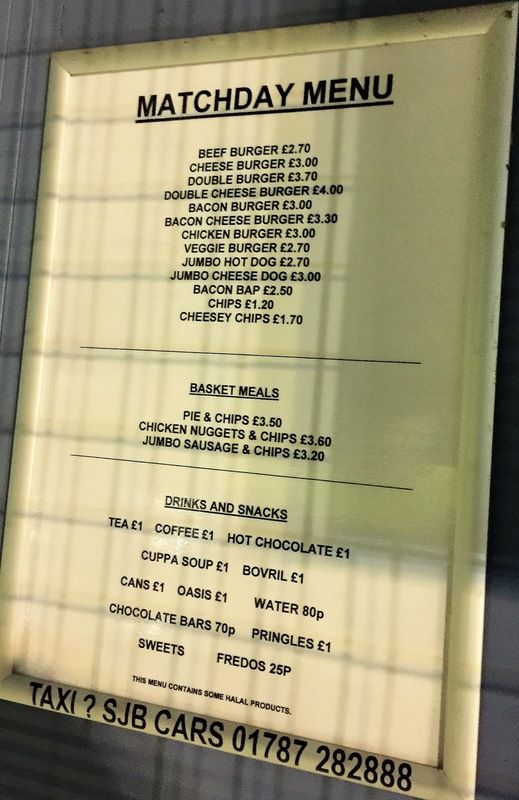 After half an hour we were at the ground and after taking pictures of the outside we went in, me paying £6 which included a programme. 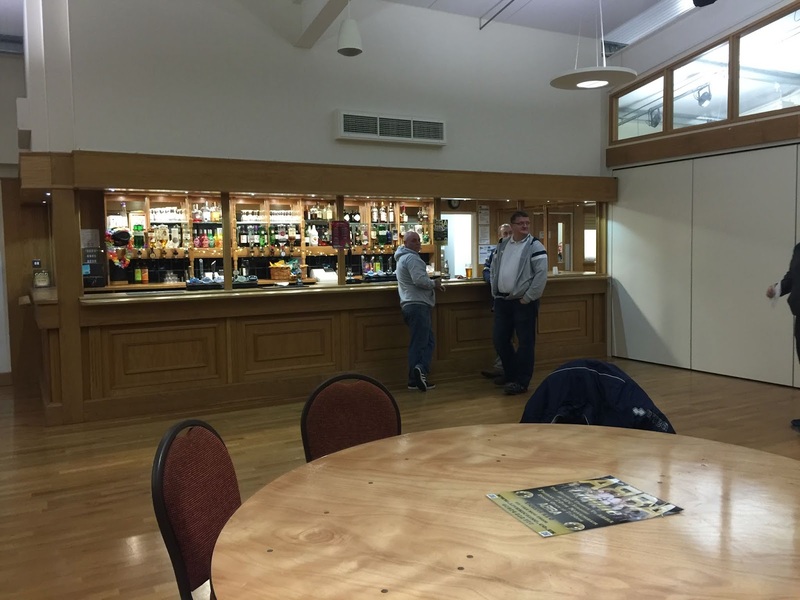 The floodlights were only part on, so I went to the bar for a £3.30 pint of Aspalls. I went outside and got pictures of the ground, as well as having a portion of chips. 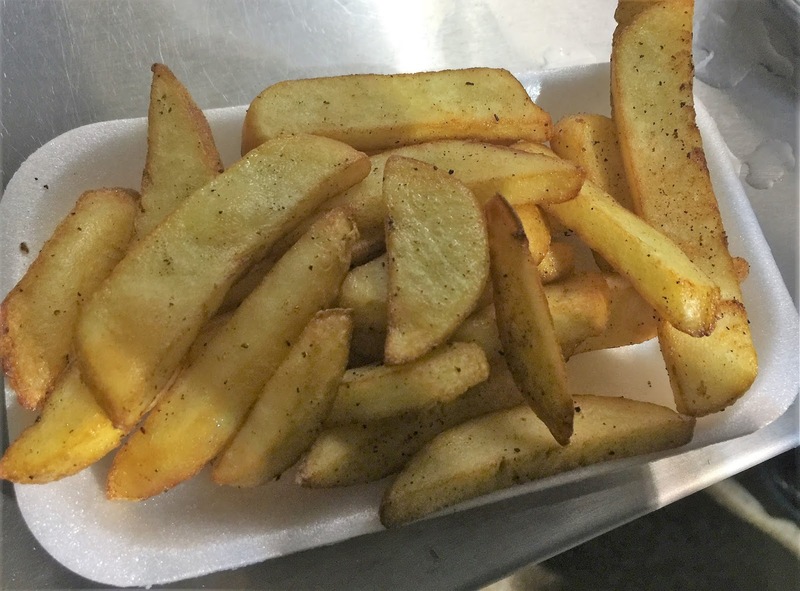 They were so good I had a second one, at £1.20 they were a bargain. I stood with the lads on the other side of the ground. AFC Sudbury dominated the first 20 minutes but it was Wivenhoe Town who took the lead, following up after the keeper parried the initial shot. The hosts continued to have the better of the game but just before halftime Wivenhoe made it 2-0 as a ball across the 6-yard box was bundled in. 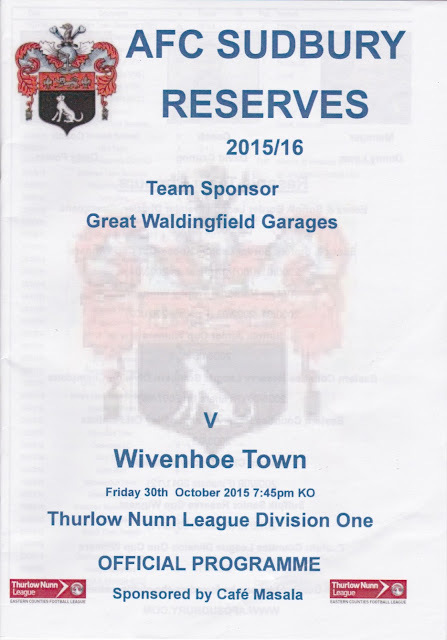 Wivenhoe bossed the start of the second half and extended their lead to 3-0 with an own goal. It was soon 4-0 with the best goal of the night, blasted into the top corner from just outside the area. It was very harsh on Sudbury and they got a consolation with 25 minutes to go with a close-range finish. Wivenhoe extended their 4 goal cushion minutes later with a fine goal as the forward slalomed through the area before finishing well. In the dying embers of the game, Wivenhoe made it 6-1 with a close-range finish. It was harsh on the hosts after they dominated the first half, but they barely had a kick in the second. I’d have said that 3-1 would have been a more reflection on proceedings. In any case, it was time to hit the road again and after dropping Dan & Maurice in Braintree at 10.15 and Anwar in Aylesbury at 11.30, I was back by 11.50. After typing my blog and watching a bit of TV I went to sleep at 1.30, ready for another day of football tomorrow. THE KINGS MARSH STADIUM is a smart ground, almost certainly good enough for the Conference South. The Main Stand holds around 300, while opposite an area of covered terracing has room for around 500. There is cover behind both goals too, though it is flat standing, probably about 800 capacity in total. The ground is smart and well presented and this extends to the bar which is large and bright with a good selection of drinks and TV sports. 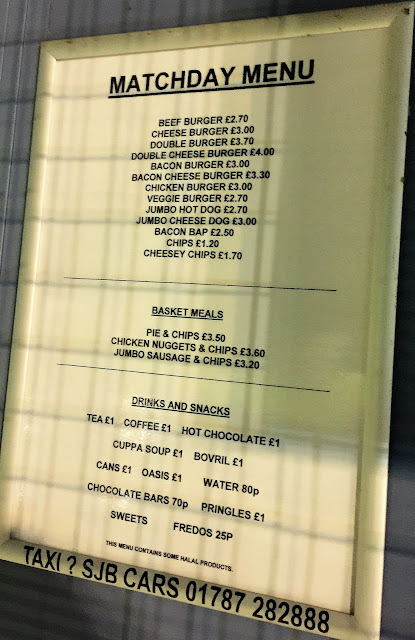 The tea bar is also excellent with great chips and a wide selection of other stuff. 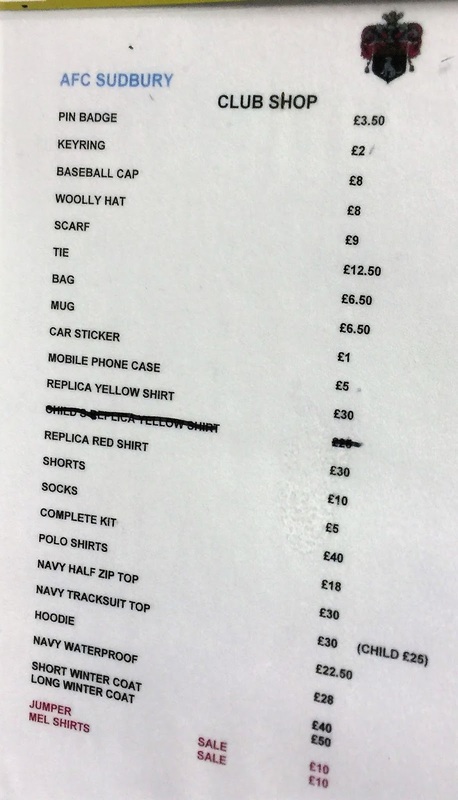 A good range of other merchandise is available, though sadly no pens, pennants or old programmes on my visit. 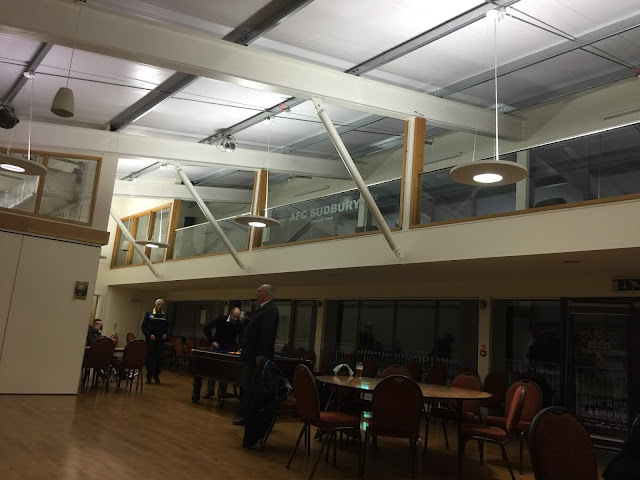 Just as well they have good facilities as the location is a fair walk from anywhere, but it’s well worth a visit, be it a first-team game in the Isthmian League or a reserves game in the Eastern Counties League.